This is one of those places that are kind of hard to miss. The outside is very colourful and the sign does it’s job and announces that you are there. There are also some chalk board menus near the outside door. Once you walk in you see an eating area with some nice windows that can light up on a sunny day. Further in there is even more seating space and a kitchen in the back. The menu covers most of the breakfast classics, from egg dishes, french toast, crepes, bagels, 3 egg omelettes and even a kids menu. Most plates are in the $8.00 price range if not even cheaper. There is also a fair amount of selection. 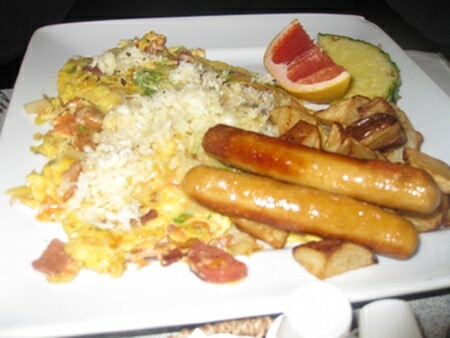 Omelettes come in 12 choices ranging from $4.45 to $7.95; crepes come in 13 choices ranging from $5.95-$7.95; french toast has 6 options ranging from $6.95-$8.25; eggs benedict comes as 4 choices ranging from $8.25-$9.95. It’s nice to find a place that can fill your stomach on a budget and the fact that the portions were quite fair makes it an even better value. We began with the approach to try out as varied an offering from the menu as possible. One good thing we noted was that in most of the dishes coming out of the kitchen came with a small mountain of varied fruit, which is something I always like to see. Another thing I was quite happy to see was a bottomless cup of coffee which always helps to start off my meal just right. 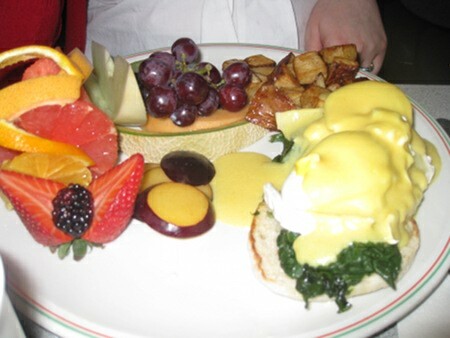 In the eggs benedict corned weighing in at $9.95 with spinach and goat cheese served on 2 English muffins is the “Florentine”. This plate can come without the goat cheese for $8.75, but the goat cheese works with this plate and makes it worth the extra $1.20. In fact of all the places I have been to (and being a huge eggs benedict fan) this one was amazing The goat cheese accented the deliciousness and the eggs and sauce with the spinach was just right – not too soggy, not too crispy. What makes this dish even more amazing is the fact that it is under $10 and considering that most places usually charge a little over $12 for a similar option, this makes this an awesome dea . Next came the “French Toast Royal” which is basically 2 pieces of french toast served on a crepe and buried under a mound of fruit. This was touted as a hungry person’s plate and I was really hungry at that point, in fact so hungry that I pulled a rookie mistake and went for the creme Anglaise on the side which brought the price from $7.45 to $7.95, although 50 cents is actually very little, it’s bothersome since I hate creme Anglaise. So life lesson learned here is don’t get blindsided by hunger. The plate itself (even with the creme Anglaise) is very affordable, and the fact that you get this giant pile of fruit on your plate is an added bonus. The fruit selection was rather varied and the slices were thick so that is always a good sign. As for the french toast and crepe, it was mediocre; the french toast was nothing to write home about and the crepe was plain and for lack of a better word, boring. They should have served this with some sort of coulis or syrop since the added sweetness would have elevated the dish. Although, that being said I did pay it under $8, the portion was generous and I got tons of fruit on my plate, so it’s actually a pretty good deal. The next menu item was the omelette “Gourmand” ($8.45). This three egg omelette comes loaded with bacon, ham, sausage, onion, tomatoes, spinach fresh vegetables and cheddar. The omelette was quite tasty and is stuffed with lots of food options in it. 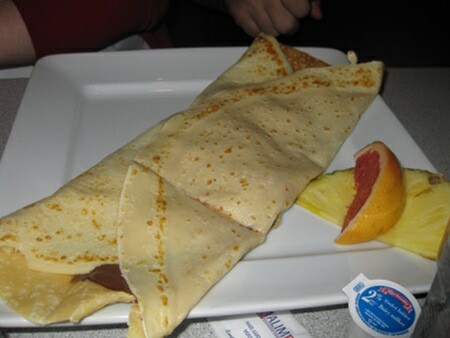 Lastly we had the banana crepe and chocolate for $6.45. I found it very chocolaty and the bananas were a nice touch but something was missing, I needed more sweet in it… Now don’t get me wrong because it was ok, but it just could have been better, as well the fact that it came with a side of 2 slices of fruit seems contrary to the other dishes which were loaded with fruit. The service was good, our waitress was very helpful with the menu explanations, and the coffee did come quite frequently. The are quite a few vegetarian options on the menu in fact most dishes were not centered on meat so you should be in good company. That and the fact they give lots of fruit will ensure some extra vegetarian tastiness, as for vegans there is not much choice since lots of the dishes have eggs or dairy in them. Overall, Fruits Folie scores well due to the fact that the prices are cheap, portions are generous, and fruit is plentiful. They also have a kids menu which is always nice to see and the eggs benedict with goat cheese is a stand out on its own. 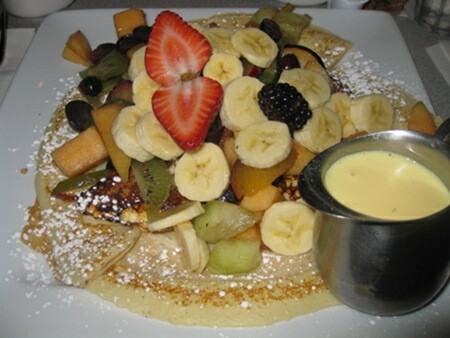 So if you are in the area and want a well priced filling place then do consider fruits folies for your next adventure. Thanks for the heads-up, I definately have to check this place out!